Adding a few new trees to your landscaping is a great way to spice things up when flowers simply won’t cut it. However, before you pick up some new saplings, you may want to know when the best time to plant trees is. Let’s take a look. As long as the heat of summer has passed and the first frost has not yet come, you’re good to get planting. That usually means that you can get started during the fall. The reason behind this is that you don’t want your saplings to suffer in the summer heat where they could be caught in a drought or scorched. 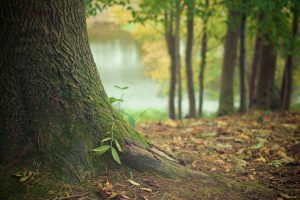 Can You Plant Trees in the Spring? Of course you can. The thing to keep in mind is that summer can wreak havoc on your plants, so make sure to give them the care they need during the harsh heat. Fruit trees, for example, may actually fair better in the spring due to the threat of winter damage. So, you can plant trees in the spring, but the best time to plant is in the fall? Well, the truth is that the type of sapling you want to plant has a lot to do with when it will have its best chance. Pine trees and other evergreens behave differently than birch trees which behave differently than lemon trees. The best thing you can do is consult an expert to ensure that you’re making the most informed decision for your trees. Nelson Tree Specialist is your home for all things trees. We can help you with all aspects of caring for your saplings, removing dead stumps, treating disease and more! Contact us for more information and to set up an appointment for us to come out and help you. We look forward to working with you. This entry was posted on Tuesday, November 20th, 2018 at 1:00 am. Both comments and pings are currently closed.